A 'Teutonic' compound on a down express passing 'BOXMOOR AND HEMEL HEMSTED' (as spelt on what seems to be an enamel sign). Do you know when this was? What about the train formation? When did Hemsted get its 'A'? The 1910 public timetable calls the station Boxmoor for Hemel Hempste'd (the space for the name was very tight and an apostrophe saved half a space compared with an “a”. So it seems that by 1910 “Hempstead” was spelt that way. I had wondered whether “Boxmoor” preceding “Hemel Hempstead” might be a clue as to date but if “Boxmoor” was first in 1910 that doesn’t help. Surely all the Teutonics had gone by 1910. 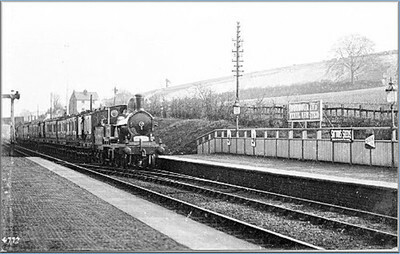 This must be a very early picture.There only appears one main line, so this photo must have been taken before the line was double tracked. On a post card used in June 1910 the name is clearly Boxmoor and Hemel Hempstead. In 1905 the postmark used was Hemel Hempstead, but on a printed post card to indistinct to read the station nameboard. The track layout is identical, the crossover leading via a central siding to the slow lines which are out of sight to the photographer’s left. The train appears to have two clerestory roofed vehicles (dining cars?) behind about 9 6-wheel carriages, and a few more behind. This suggests 1893 or later – I am not sure when these diners came in. The engine enables this photograph to be dated between March 1889, when the first Teutonic was built, and 1895, when coal rails began to be fitted on tenders. According to "Clinker's Register of Closed Passenger Stations" the first time the name appeared with a letter "a" was on 1 July 1930, when the station was renamed from "Boxmoor & Hemel Hempsted" to "Hemel Hempstead and Boxmoor". Before that date the name had been changed several times, with and without the "H H" suffix, but always without the "a". Posted in June 1911 this postcard clearly shows the name with the "A", so the information in Clinker is wrong. Was this perhaps one of those occasions where nameboard and official records differed? Click on image above to see scan of postcard as well as larger image. This turns out to be rather more complicated than I imagined! I thought I ought to refer to LNWR primary documents as a basis for any opinion. LNWR Southern Division WTTs from 1891 to 1924 all just say simply "Boxmoor", both on the timing pages and in the list of signalboxes in the back. LNWR Southern Division wages grade staff ledgers from 1890 to 1911 equally just say "Boxmoor" [RAIL410/1799, 1801]. In other cases the title at the head of the page is amended in red when the name changed, but not in this case. - this seems to be entirely at odds with the station nameboards. There is nothing in the minutes of the Officers' Conference in Oct-Nov-Dec 1912, nor Jan 1913 to back up Clinker's idea of "and Hemel Hempsted" being added w.e.f. 17.12.1912. Other station name changes in this period are reliably recorded in the minutes. Clinker is normally reliable, so whence did he get his information? The RCH "Handbook of Stations" 1895, 1904 and 1912 issues all list it as "Boxmoor and Hemel Hempstead" which agrees with the nameboards, if not printed documentation! From April 1924 it is amended to just "Boxmoor", but then in the 1925 and 1928 issues of the Handbook it is "Boxmoor and Hemel Hempsted" (no a). Which agrees with Clinker inasfaras he says that it was simply "Boxmoor" from 2.6..24 until 1.9.24. But they disagree about the spelling!